The skull (also called the cranium) has evolved over a million years to protect the remarkable computer that is the human mind. The first role of the skull is to provide a super structure to hold the structures of the head, including the brain, the eyes, the jaw, the nose and ears. The second role of the skull is to provide protection to the most fragile of those components, which are primarily those contained within, the brain, the inner ear, the cranial nerves, the spinal cord. The openings in the skull are clues as to the placement of those critical components of the human anatomy. 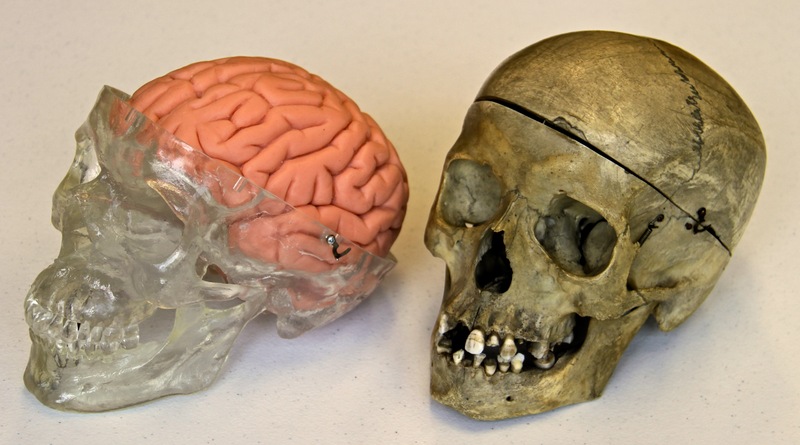 Shown on the left is a model skull, with a flexible foam rubber brain. On the right is an actual human skull. The helmet role that the skull plays, is obvious. It protects the brain from blows that might crush or damage it. However,the “survival of the fittest” elements of evolution have had a lot longer time to evolve to protect us from clubs, than bullets and high speed motor vehicle collisions. The skull also is part of the brain’s egg carton. Like an egg carton, which contains not only a protective outer shell for the fragile egg, the cranium also contains a cradle mechanism to suspend the brain from shocks and jolts. Included as part of the egg carton design is several layers of protection beginning with the skin. 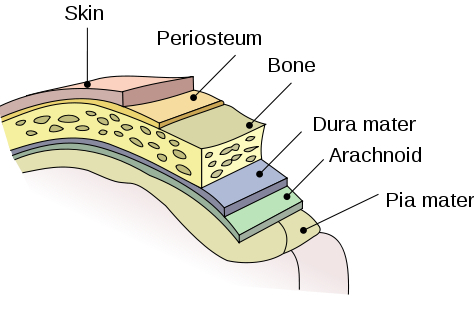 It also includes the bone of the cranium, the dura, the arachnoid and the pia mater. The dura, the arachnoid and the pia mater are meninges, which encase the brain. The dura is a thick membrane that surrounds the brain and the spinal cord. It is an often heard term in the ICU in diagnosis such as of “epidural” (above or outside the dura) and “subdural” (inside or below) bleeds or hematomas that may require brain surgery to correct. Unfortunately, human evolution has not kept up with the forces in modern technology in protecting the brain when the human body and head are suddenly stopped from high speeds. While we have gone from human running speed to super sonic speeds in a few hundred years, human evolution moves much slower. It takes hundreds of millennia for evolution to make significant adaptations in the human body. Thus, the skull rather than becoming a protector in the modern accident, can actually become the chief weapon of injury. Not only can skulls be fractured, the collision between the brain and its protective devices can cause severe injury. Further, in the event of a brain bleed or brain swelling, the fixed capacity of an inflexible container to contain fluids, creates the dangerous increases in pressure inside the skull. Increases in intracranial pressure happen when the heart pumps more blood into the cranium than it pumps out.